Both porcelain and acrylic bathtubs have advantages and disadvantages. A porcelain bathtub is usually constructed on a base made of iron or steel, glass or tile. Commonly, the base is porcelain enamel coated and then high-temperature fired. Acrylic bathtubs are usually molded through a thermal process that bonds an acrylic finish over fiberglass reinforcement. In general, porcelain tubs are heavier than acrylic bathtubs. Bathtubs of acrylic or porcelain each have advantages. 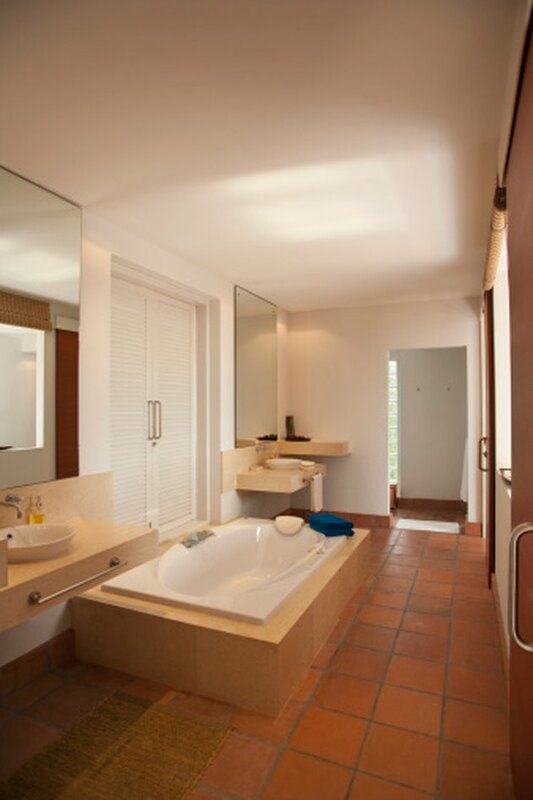 Porcelain bathtubs tend to lose heat and feel cold more quickly than acrylic tubs. To counteract the heat some loss, some porcelain models may be foam insulated. Acrylic, non-metal tubs tend to retain heat better than porcelain. Porcelain is usually a harder surface than acrylic, and the porcelain coating is resistant to scratching. However, a hard impact may chip porcelain. Acrylic is a softer material that is less scratch resistant than porcelain. At the same time, scratches in acrylic may respond to a buffing with a combination of toothpaste or a baking soda paste applied with the pressure of the heel of your hand. Acrylic can be both tough and easy care. It is a common choice for outdoor spas because of its ability to withstand chemicals, fluctuations in temperature and the sun's ultraviolet rays. An acrylic bathtub usually requires cleaning with only mild nonabrasive liquid cleaners. Similarly, a mild detergent or a warm water plus baking soda paste will usually get a porcelain bathtub clean. Scouring powders can leave scratches that, while they are not visible to the eye, erode the bathtub surface. Once scratched, the surface then collects dirt, oils and soapy residues. As time passes, the stains become more embedded and difficult to remove. The use of acids should also be avoided since these can damage the porcelain finish. To restore an acrylic bathtub's high gloss if the sheen is lost may be possible with a buffer and rubbing compound. A fine sanding process could also be required if the finish is damaged. Professional restoration may be advisable. 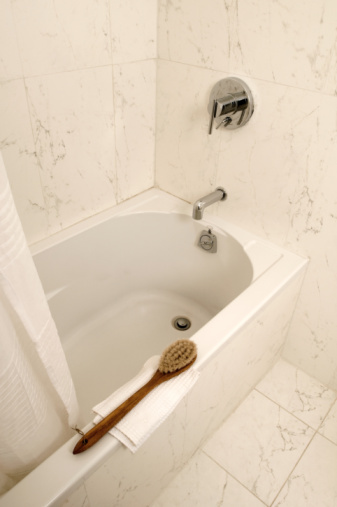 If a porcelain bathtub surface is damaged through improper cleaning procedures or chipping, it also can be refinished. The process requires application of porcelain enamel. Kits are on the market and available to consumers. However, results may be more favorable with professional application. Another advantage to contracting with a professional is obtaining a comprehensive warranty. Before disposing of a discarded bathtub, check with your local authority for trash disposal or recycling. Porcelain, for example, may be disposed of in some city's trash and may not be considered recyclable. Additionally, in an advisory published by the State of Oregon in 2011, porcelain bathtubs are noted as a potential source of environmental exposure to lead.